The Royal Crosscut Shredder, 89120p CX80, will help you safely eliminate personal documents with ease. It is designed to shred eight (8) sheets of paper simultaneously per pass, and also has the ability to shred staples and credit cards. This 8-sheet Royal crosscut paper shredder includes an auto start and stop function when in use and an easy-access pullout bin to get the shredded refuse. This little guy does the trick without taking up a lot of space! I like the pull out basket so dumping the shredded paper doesn't end up in a huge clean up effort! I replaced a much larger shredder with no credit card slot for shredding with this one. Fits easily under my desk, and the wastebasket slides out for easy emptying. The original worked fine, but it had clearly been opened, which was fine, but it had also been used. I called Overstock to ask them about the warranty, and they sent me a new one with a label to return the old one. Class act! I love that you can empty the shredded paper by pulling out the receptacle from the front. The last shredder I had - you had to lift the top off and it made a mess. This one is great and shreds credit cards as well. Just what I needed to get rid of unsolicited mail. This is a great little machine for home use. It says it will shred up to eight sheets but I have not tried that as it seems to be working quite hard when I put in four. It is compact and slides right under my desk. Have no regrets so far. I was hesitant to buy this at the low price... Wow this little shredder gets it done! It tears it up fast and cross cuts the sheet well. It says you can put 8 sheets in but 6 sheets is really max. Good product--hope it lasts a long time! This shredder is very good for the home. It is a little loud, but nothing more than our last shredder. Does the job quickly. I don't think it would handle big, long lasting shredding jobs. But for the occasionally home shredding, it works great!! For the price, you can't beat it!! Plus, it has a credit card shredding slot!! I had a paper shredder for years and it finally gave out. I purchased on from Amazon and had to send it back, it did not work on one piece of paper let alone 6 sheets that it claim. I was nervous about ordering another on but I saw this one on Overstock and decided to try it. It is great and would recommend it to everyone. This is a fabulous bargain! I love the small size and it shreds into such small pieces that you can do a lot before having to empty, and it's so easy to empty - no having to vacuum after. The credit card shredder is a huge bonus. Like any shredder, don't test it by overloading. I do 4-5 pages max instead of 8. I think it's way underpriced, but glad I took the deal! This is a perfect size for a home office that only shreds personal things. It fits perfectly under our desk and doesn't take up too much room! Works great too! This is perfect for my home office where I don't have a huge load of shredding to do. I like the pull out basket so you don't have to lift up the heavy top like my last shredder and you don't get paper scraps all over the floor when you empty it. A good purchase! this is an okay shredder. I can only get about 5 pages at a time. maybe i can push it to 6 but the thing does so with 5 pages. it does over heat fast. I can do about 20-30 pages and then it over heats and stops working. I have to wait about 20 or so minutes until i can use it again. I use that time to clean it out. most of the time, the paper gets stuck in the cutters and you need to go back and forth a few times to have it clean itself out. a pain but for the price, not that bad. Great shredder for the money! Works great, just don't put any more paper in than suggested in instructions. Great for the price, others can be *** more for the same item. We have been very pleased with this purchase. Great quality for the price and has been sturdier than expected. Good buy and great price. Gets the job done....very pleased. Works very well - great for the price! I gave it away . It is very light weight and didn't shred well. For the price, it wasn't comparable to our old one. Easy access to shredded paper. "What type of shredder is it? microcut crosscut etc. What is the duty cycle? Light, Medium, Heavy?" "Will it shred CDs too?" Thank you for your question maxhinmon. Unfortunately, the Royal CX80 Paper Shredder will not shred cd's. Have a great day. I'll have to try when I get home and get back to you. "Does this shred credit cards?" 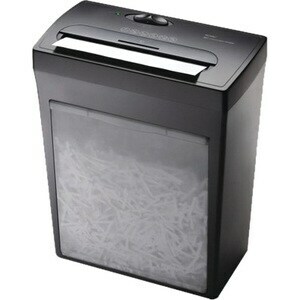 Hello thetwigs, with the Royal CX80 Paper Shredder you can shreds credit cards and staples. Please feel free to contact us again with any further questions. Thank you for shopping with us! "How many sheets with this shredder shred at one time?" Hello lakidd, the Royal CX80 Paper Shredder can shred up to 8 paper at one time. Please feel free to contact us again with any further questions. Thank you for shopping with us! "can you use a shredder bag with the pull out drawer?" Thank you for contacting us turnipwolf.Yes you can. Please let us know if you have any further questions. "What are the measurements of this product?" Thank you for your question verona24. The measurements are: 6.88 inches d x 12.5 inches w x 14.75 inches h. Have a great day. How to Oil a Paper Shredder from Overstock.com. Our guides provide customers with information about how to oil a paper shredder.